Ashley Clark was born and raised in Fort Myers, so she understands the benefits of living in Southwest Florida with its unmatched weather, miles of beaches, and natural beauty. 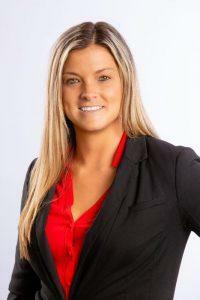 Ashley began her career in real estate helping people find the perfect timeshare vacation destination in the area. It was during the search for her own local piece of paradise that she realized she had a passion for helping people find their dream home. The team atmosphere at Miloff Aubuchon Realty Group is what attracted her to work with The Jeff Miloff Team. The training and support provided were very important aspects to help Ashely grow in her real estate career. Ashley spends as much of her free time as possible enjoying the outdoors and being on the water. She’s active with a local CrossFit group, and plays volleyball and softball. Ashley strives daily to be positive and hardworking. She believes that trust, honesty, and doing the right thing are the most important aspects of her life. She is dedicated to providing a pleasant and smooth real estate experience and will go above and beyond to provide the best service to her clients. Whether buying or selling a home, look to Ashley Clark to help with all of your real estate needs. Contact her via e-mail at aclark@miloffaubuchonrealty.com or call direct 239-841-0780.